I can not believe summer will be over pretty soon. They kids will be back to school and I for one am looking forward to just getting back into our routine. As always with summer come delicious grilled everything! Being that we do not live where its warm all year round I grill as much as I can from start to finish. I just love trying out new things to grill like my Grilled Summer Fruit Salad. We eat a lot of chicken in this house. Besides pasta it is always my go to meal to make for dinner. Mainly because it is just so versatile and pretty easy to conjure up something new with. These are the tastiest chicken kabobs. Marinated in a light herb marinade and grilled to perfection. You could serve them for lunch, dinner and even for a cookout or dinner party. If using wooden skewers, about an hour before yo are ready to assemble the kabobs, soak the skewers in water. This will ensure they do not burn. Place 4 pieces on each skewer. You should end up with 8 kabobs. Heat your grill to medium high heat about 350 degrees F. Grill 4-5 minutes on each side. Drizzle with your favorite dressing if desired. These look incredible Rina, love how you flavored these. So easy too!! I'm pinning! These looks so yummy. Thanks for sharing, it's making me so hungry! So simple and delicious! I love recipes like this. I would be honored if you would come share this at Pin Your Friday Favorite on my blog. Have a great weekend! 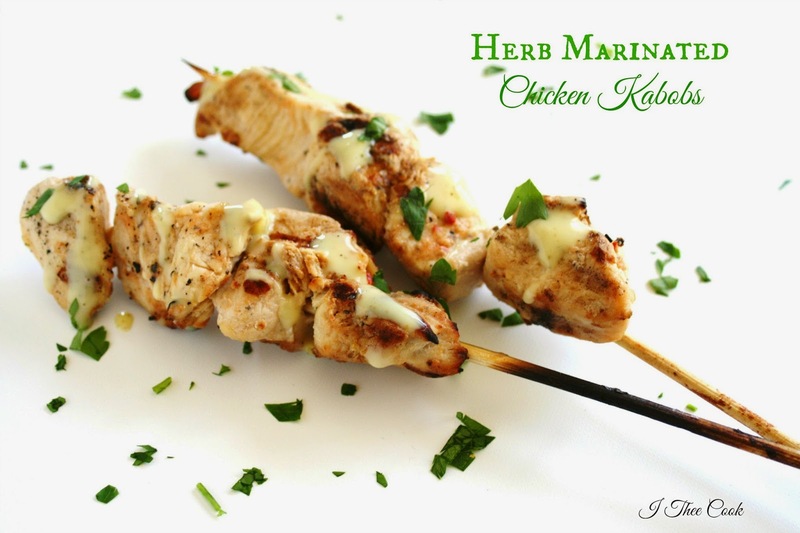 The Marinate for your Chicken Kabobs looks so good, we would love these. Thanks so much for sharing with Full Plate Thursday and have a great weekend! I love the simplicity of these kabobs... fresh and tasty. Pinned. These look DIVINE! Pinning and Sharing! Thanks for sharing on Wake Up Wednesday! These look so beautiful and tasty! Thanks so much for the recipe. Pinning it now!